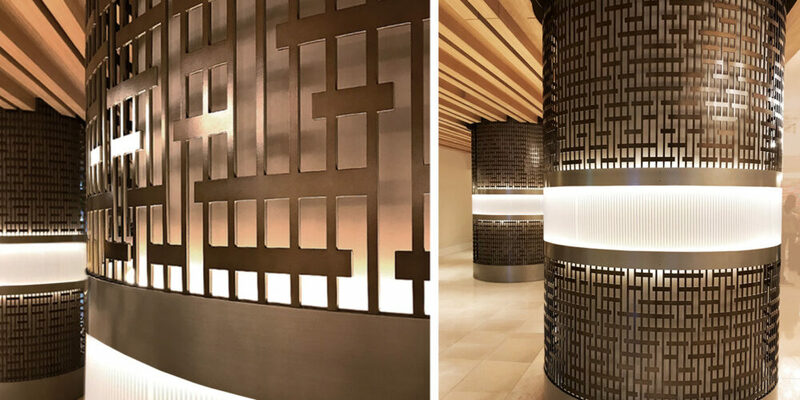 When the Sheraton Hotel decided to renovate their lobby in downtown Seattle, designers brought in Móz Designs to create a unique solution for the structural columns located near guest check-in. The four-star hotel opened in 1982, and continues to be a popular choice for Seattle visitors thanks to its close proximity to the Washington State Convention & Trade Center and the retail core of downtown. After its $130 million renovation, which began in 2005, the Sheraton Seattle now includes 75,000 square feet of ballroom and breakout space, 47 meeting rooms, and 1,258 guest rooms. Hotel lobbies are the first point of contact with guests, providing an opportunity to make a great first impression. The lobby is also a high traffic area, which is why designers at Hirsch Bedner Associates, wanted to insure the new design was both eye-catching and inviting. 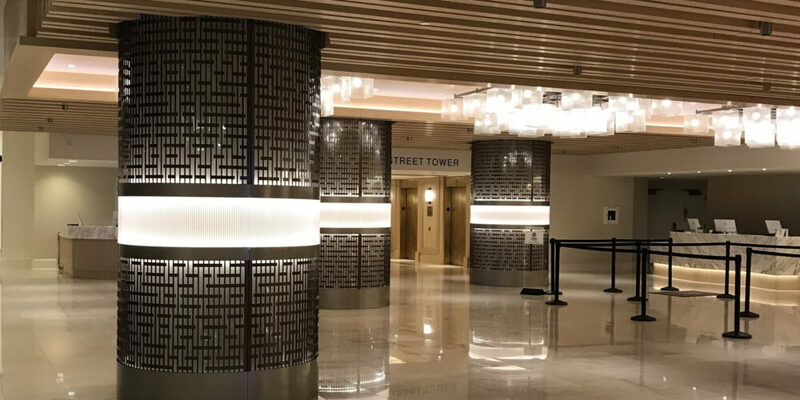 Centrally located in the entrance of the Sheraton Hotel, these sleek columns bring a fresh look to a hotel that has become a Seattle landmark. Designers used Moz’s solid-core aluminum to create six striking double layered column covers. The outer layer is a custom Laser Cut pattern in Classic Medium Bronze, which is complemented by a painted inner layer creating a mesmerizing three-dimensional effect. The backlit acrylic panels by Envel Design add a pop of color and infuses the space with light. The outer column is 3/16” aluminum featuring a custom Laser Cut pattern in Classic Medium Bronze with Classic Titanium trims.